Cigar box guitars have never been more popular and now you can learn to make your own. You don't need to spend a lot of money and you don't need to have a shop full of tools. All you need to do is follow the author's step-by-step instructions for making three different styles of guitar. They're fun (some would say addictive) to build and even more fun to play! The guitars that can be made with this book: Basic CBG: A simple build with the minimum number of components. It's a three string acoustic instrument built from a paper covered box and played with a slide and has burned-in fret lines, but no real frets. Slightly Nicer CBG. Uses a nicer cigar box, has a more decorative headstock. Also has real metal frets and three strings. In addition, this one incorporates a very simple piezo pickup so it can be played through an amplifier. Slightly more complex in woodworking terms and involves a bit of wiring and soldering. Cigar Box Telecaster. This one would be built from a cigar box and a pre-fabbed six-string guitar neck. It would use commercial pickups and volume/tone controls. I'm picturing it as a tribute to the Fender Telecaster. It involves more complicated woodworking and much more wiring/soldering, as well as filling much of the box with wood to support the tension of six steel strings. More than just a how-to guide, this book chronicles the modern revival of the cigar box guitar. You'll learn a bit about its roots, influential personalities and the cultural trends that are bringing this instrument back to the musical landscape. Author and professional photographer, David Sutton introduces readers the faces of the CGB movement with in-depth profiles and photographic portraits of fascinating builders and performers. A perfect opportunity to put a real American tradition in your own hands. There's nothing more rootsy than a Cigar Box Guitar. If you?re not familiar with this musical art project, it's time to get acquainted. D.I.Y. craftsmanship is a plus when embarking on this dexterous adventure. And, it's time to get on board with your music-loving kin for what could become a new fest family tradition. Instead of special brownie baking, graduate to Cigar Box Guitar making. The Cigar Box Guitar Revolution is spreading across the nation, and it's your mission to introduce this down-home porch pastime to your audio amigos. Bring the artistry fest-side and prepare for 2012 Fest Season with a whole new band ? of handcrafted guitars. What makes these melodic toys so nifty? Their uniqueness, of course. Each CBG is constructed from your own personal heap of hoarded delights. That's right. It's time to donate your clutter to something useful. But, how does one go about creating one of these grassroots instruments? D.I.Y. masters, this one's for you. 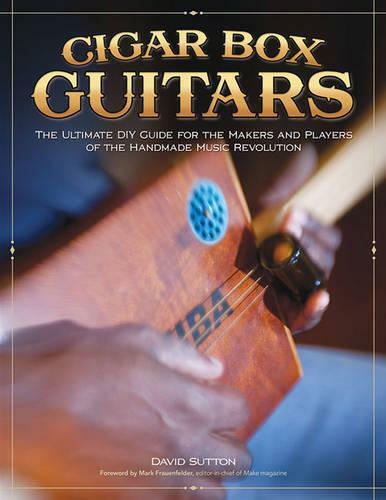 A copy of Cigar Box Guitars: The Ultimate DIY Guide for the Makers and Players of the Handmade Music Revolution is the ideal how-to source. The book is laced with images and tutorials on how to design up to three different models of Cigar Box Guitars, courtesy of author/photographer David Sutton. A great new book devoted to Cigar Box Guitars and the people who build them has just been released by Fox Chapel publishing... Filled with beautiful full-color photos, interviews with many of the biggest names in the cigar box guitar movement, and lots of practical how-to information, this is a great book for either the coffee table or the workshop - or both! Smoke 'em if you've got 'em - and then get creative! "It was pretty fun how this all came together," says David Sutton, whose book, Cigar Box Guitars: The Ultimate DIY Guide For The Makers And Players Of The Handmade Music Revolution, will be issued by Fox Chapel Publishing on 1 March 2012. "Through the years I've been active in woodworking, guitar playing, photography and writing. So this project combined my interests beautifully." Five years ago, Sutton wanted to give his young daughter an acoustic guitar for a birthday present, but he didn't feel right about parting with one of his vintage beauties - and besides, they were too large anyway. "I had heard about cigar box guitars, so I thought, Hey, why not just build her one?" says Sutton. "I was stunned to find that there was hardly anything on Google about building a cigar box guitar. That really surprised me." There was one site, however, that offered useful information on how to build a wooden cigar box guitar. Sutton followed the instructions and built not one, but two guitars, one for his daughter and one for himself. "The whole experience really got me excited," he says. "I knew I wanted to spread the word." Sutton contacted Fox Chapel Publishing about putting together a book on cigar box guitars. He figured that he wouldn't hear anything at all, and if he did, it would be a rejection. But the next morning, a rep from the company called to say they were keenly interested - and when could it be finished? "I was so unprepared for that," says Sutton. "But I think I threw them when I said I wanted to do a book with three separate components, the first showing people how to build straight-up acoustic models for slide, the second for fretted electrics, and a third and last chapter for six-string electrics. Before long, they realized that the three-section approach was the way to go." In reaching out to fellow cigar box guitar builders, Sutton was more than impressed at how the movement had grown in the time since he had first thought of crafting a model for his daughter. "It exploded almost overnight," he says. "All of these people are building cigar box guitars. They're totally into it, and they're very into helping one another out and creating a community. "The guitars people are building range from simple, cardboard diddley bow-type instruments to wooden box electric six-string models that are just as good as something you can buy in a store. At first I was fascinated by the guitars alone, but then I got into the folks making them. Their stories are incredible." Sutton insists that the makers of cigar box guitars aren't luddites; rather, they're discerning craftspeople who yearn for a personal connection to their instruments. "They occupy a niche, but they're a growing niche," says Sutton. "Mass market guitars exist for many people. For others, there's something else - and that's beginning to mean cigar box guitars." art DIY guide, part scrapbook ? this book takes you behind the music to get a glimpse into the faces, places and workshops of the cigar box revolution. Cigar box guitars have never been more popular and now you can learn to make your own. You don't need to spend a lot of money and you don't need to have a shop full of tools. All you need to do is follow the author's step-by-step instructions for making three different styles of guitar. They're fun (some would say addictive) to build and even more fun to play! The guitars that can be made with this book: Basic CBG: A simple build with the minimum number of components. It's a three string acoustic instrument built from a paper covered box and played with a slide and has burned-in fret lines, but no real frets. Slightly Nicer CBG. Uses a nicer cigar box, has a more decorative, built-up headstock. Also has burned in fret-lines and three strings. In addition, this one incorporates a very simple piezo pickup so it can be played through an amplifier. Slightly more complex in woodworking terms and involves a bit of wiring and soldering. Cigar Box Telecaster. This one would be built from a cigar box and a pre-fabbed six-string guitar neck. It would use commercial pickups and volume/tone controls. I'm picturing it as a tribute to the Fender Telecaster. It involves more complicated woodworking and much more wiring/soldering, as well as filling much of the box with wood to support the tension of six steel strings. More than just a how-to guide, this book chronicles the modern revival of the cigar box guitar. You?ll learn a bit about its roots, influential personalities and the cultural trends that are bringing this instrument back to the musical landscape. Author and professional photographer, David Sutton introduces readers the faces of the CGB movement with in-depth profiles and photographic portraits of fascinating builders and performers. Basic information about learning to play and tune a cigar box guitar are also included. A perfect opportunity to put a real American tradition in your own hands. You might be accustomed to seeing Evanston photographer David Sutton with a camera in one hand. These days, though, he's just as likely to have a homemade cigar box guitar in the other. Sutton, whose fame as a photographer of people and their pets is such that Forbes magazine has called him America's best, has written a book about his newest passion entitled Cigar Box Guitars: The Ultimate DIY Guide for Makers and Players of the Handmade Music Revolution (Fox Chapel Publishing, 2012). And, as you might expect, it's full of Sutton photos illustrating how to make your own musical instrument ? and your own music. A longtime amateur woodworker who has also played guitar since he was a boy, Sutton said he started thinking about making one around five years ago, when his five-year-old daughter Alisha expressed an interested in his guitars. ?I wanted to give her one, so she could try it out, but she was so little. I?d hover, thinking, ?She's going to bang it up? ? mainly because they were so big and unwieldy, ? he said. ?Then, out of nowhere, I had this thought: ?Cigar box guitars.? I don't know where it came from. Maybe my dad mentioned it when I was a kid.? Basic pattern Regardless, Sutton looked online and found a site or two with minimalistic plans for making a real, honest-to-goodness, 19th-century/Depression-era favorite, three-string guitar out of a 1 x 2 pine neck, a few old tuning keys, and a cigar box for the body. He made one for his daughter and one for himself and was a little surprised about how much of a kick he got out of playing this thing he?d made with his own hands. Although he?d played guitar most of his life, he said he felt different about the music he made on his homemade instrument. Though he had previously never felt comfortable performing for others, he felt competent and confident playing his cigar box special ? along with a special thrill about the sound it made. ?After you?ve made your own guitar, making your own music makes simple sense, ? he said. ?It's a great de-mystifying process, making your own instrument. Building one, somehow, makes playing music on it seem more accessible.? Sutton isn't the only one who's made this discovery ? far from it. When he first looked online for cigar box guitar plans, he could find only a couple of modest posts from aficionados. Now, five years later, a full-fledged homemade-music community has grown up on the Internet, with cigar box guitars in the forefront. DIY sites Look up Cigar Box Guitars on YouTube and you will find countless entries by people either explaining how to build or play CBGs (particularly videos demonstrating old-school, gut-bucket, down-home slide-guitar blues), sometimes with tens of thousands of views apiece. In addition, websites such as cigarboxnation.com and handmademusicclubhouse.com have racked up thousands of subscribers. What's behind the sudden rise in awareness about the joys of homemade music? ?Well, we?re not as rich as we thought we were, ? Sutton said, with a laugh. ?Perhaps because of the economy and perhaps just as a reaction to the idea that only professionals can be artists and entertainers, the idea that you have to buy your fun is petering out. People are realizing you don't have to have the biggest, finest, most expensive stuff to have fun, or make music. If you?ve got a cigar box and some old strings and a few used tuners, and a real desire to play, that's all you need. ?